Shakhrisabz is one of the ancient cities in the Great Silk Road. Today the city has a lot of architectural sights; historical center of the city is inscribed on the UNESCO World Heritage List. This city is also famous for the name of the country where the great Sakhibkiran Amir Temur was born. Shakhrisabz is one of the most beautiful and colorful Uzbekistan cities, which is located 80 km south of Samarkand, beyond the alpine pass of Takhta-Karacha. 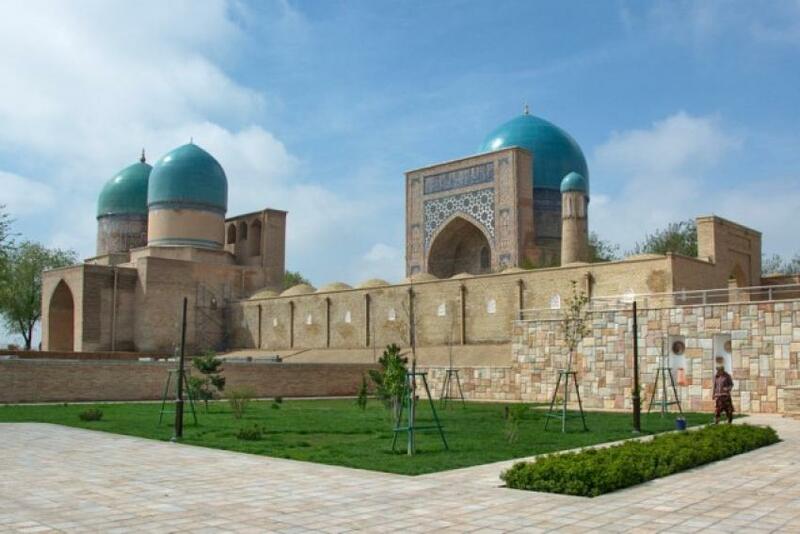 Whichever time you come to this ancient city, you will see all the beauty of this great green garden.Looking at the well-groomed modern appearance it is difficult to believe that this city is 2700 years old and that it has played a significant role in the history of Central Asian region. Formerly Shakhrisabz was the capital of the ancient state of Sogd and had the name of Kesh. It was the famous center of culture, trade and handicrafts. In 329 BC Alexander the Great conquered the city and soon Hellenistic culture and cult of the Greek gods appeared there. Over millennium Shakhrisabz was under the reign of various dynasties and in the 8th century it was the center of anti-Arab and anti-Islam rebellion.Today this wonderful city is more famous thanks to Amir Temur (Tamerlane), who was born in the neighboring village of Khodja-Ilgar. Becoming the ruler, he turned Shakhrisabz into his residence and ordered to build the palace, known as Ak-Saray (White palace). By the way, at that time Kesh was renamed to Shakhrisabz, which means in Persian “Green city”. Here you will find ruins of the palace Ak-Saray, the memorial complex DorutTilovat, the mosque Kok-Gumbaz, mausoleums DorusSiodat, Shamsad-Dina Kulyala, Gumbazi-Seyidan. For years, the city government has been planning the city building so that to preserve ancient Shakhrisabz monuments for next generations. Economy of the city is concentrated on the cotton processing, preservation, agricultural machinery manufacture and handicrafts. Shakhrisabz is renowned for peculiar carpet weaving, fine embroidery, uzbek skullcaps. Handicraft industry has the long-years history and has taken in cultures of neighboring nations. Articles of local masters win many international exhibitions and festivals. Moreover, Shakhrisabz is famous for its brand wine, which took first places on international wine competitions. Also Shakhrisabz has transport importance: it is located on the Great Uzbek Highway, which repeats the route of the Italian traveler and trader Marco Polo.